For virtual reality newcomers, the new Gear VR with controller is one of the best options on the market as well as one of the most affordable. If you own the latest Samsung phone, or one released two years ago, this headset and controller combo is the best option available. Update: Samsung has been fairly quiet about VR recently, but it's offering Gear VR owners a free adapter to make it compatible with the Galaxy Note 9, so it's definitely not forgotten about it. Rumors of a new headset have been circulating for a while, but we've yet to see anything concrete from the company. The Samsung Gear VR is one of the best and cheapest ways to experiences virtual reality if you own a Samsung smartphone. And, now that you can pair it with a motion controller, it’s feels a lot more immersive. 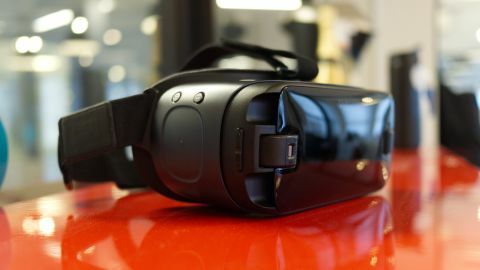 The newest Gear VR for 2018 touts a streamlined, slightly improved design and features a USB-C connector that hooks directly into the Samsung Galaxy S9 and Samsung Galaxy S9 Plus. However, the big draw here is the included wireless controller in the box. It’s a small remote that looks similar to an HTC Vive controller, elevated touchpad, punchy trigger and all. And, while it may not get points for originality, it just works. Placed in either the right or left hand, this controller is simple to pair to your phone, and the motion controls add a new level of interactivity that was sorely missing from the Gear VR suite. Altogether, with the robust and ever-growing collection of VR content and the new controller, the new Gear VR is a painless recommendation. It’s lighter, more comfortable and cross-compatible with older Samsung phones, too. However, if you already own a previous version of the headset, you can pick up the controller separately. The new Samsung Gear VR is available now to the tune of $129 (about £100, AU$117) and includes both the updated headset and its new accompanying controller. If you hunt, you can find it for cheaper online. For those already rocking a Gear VR headset, Samsung plans on selling the controller separately for $39 (about £30, AU$50). And, if you’re looking for a deal on the Samsung Gear VR, you’re in luck. Right now on Amazon in the US, you can pick up the Samsung Gear VR for just $86.99 (about £68.61, AU$116.52) with a controller. The look of the new versus the old Samsung Gear VR isn’t night and day, though it has shed about a quarter pound in weight. When compared to the sleeker, smaller Google Daydream View, it’s still rather monstrous, but its size advantage yields unique benefits over Google’s one-size-fits-all headset. First off, the optics inside can be adjusted using the top-mounted dial to make the picture easier to see for your eyes. Google’s headset comes at a fixed position and it may take some extra effort to see a clear image. Keeping the light out is something that the Gear VR has always been good at and the new model is no exception. A welcome area of improvement is the breathability of the headset. On the first iteration, things would get steamy after a few minutes of use, rendering the lenses foggy like a mirror after a hot shower. But by adding a few more air vents beneath the eyes, I no longer find this to be an issue. Compared to the older model, the cushion that rests around your eyes and nose is noticeably cozier and more supportive. Included in the box is a controller holder that can be installed into the head strap for easy storage. The buttons and port location are familiar on the new headset, though they have received some tweaking. To match the layout of the new controller, the new headset’s touchpad now features a home button to take you straight out of any app or game that using you’re using. Confusingly, Samsung steamrolled the directional pad-shaped indicators on the touchpad. Sure, if you’ve used the Gear VR before, you’ll probably adjust easily to the change. But VR first timers might be put off, as the new solution doesn’t present the most intuitive control scheme. Instead of the microUSB port found on bottom of the original Gear VR that was used for keeping your phone charged, the new headset features a USB-C port that can do the same. Samsung touts it as a multifunction port, so it’s very likely that we’ll see more accessories coming that expand its capabilities, much like how the controller has done. And likely, the refurbished Samsung Galaxy Note 7, whenever that shows up. The little controller is certainly the highlight of the show, so let’s dig into it. The motion-enabled wand matches the dark aesthetic of the new Gear VR, though it also goes nicely with the older model. Powered by two AAA batteries, the small controller features a volume rocker, as well as a circular touchpad and the back and home button duo to mimic what’s found on the side of the headset. On its back, there’s a single trigger, which is nice to have for the inevitable onslaught of first-person shooters. There are a handful of games that offer controller compatibility and they work in a manner that you’d expect if you’ve played anything on Google’s Daydream headset or even the Nintendo Wii. You can aim the controller around in the virtual reality world to select, shoot or pick up objects. Compared to other experiences, Samsung’s controller feels and performs on par. For many early pre-order adopters of the Samsung Galaxy S8 and Samsung Galaxy S8 Plus, the new headset and its controller will come free. But even at $39 (about £30, AU$50), the controller is a welcome, well built addition to the Gear VR family. Samsung has made the controller compatible with the backlog of apps and games that are already available to users. Both the trigger and touchpad execute the same simple “confirm” command, but the motion capabilities are otherwise turned off.